Serve mouthwatering gelato, Italian ice, sorbet, and more with the Excellence PFC-7 six pan gelato dipping cabinet. Designed to display up to seven 5-liter pans at once with storage underneath for up to 19 more, this unit is sure to keep up with the demands of any high volume operation! The cabinet is fitted with a tempered curved glass sneeze guard to protect against airborne contaminants and give your customers a full view of your most popular dessert offerings. A powerful 1 hp compressor is paired with R-404a refrigerant to maintain an internal temperature between 3.2 and 7 degrees Fahrenheit, while 60mm thick polyurethane insulation ensures that the cold air is trapped inside to help improve energy efficiency. An electronic control board allows for further customization, and self-defrosting capabilities work to keep the products at the appropriate serving temperature. Guaranteed to boost impulse sales and increase your serving potential, this unit features bright internal lighting to draw attention to your display. A rear pivoting door allows for easy maintenance and cleaning when not in use. 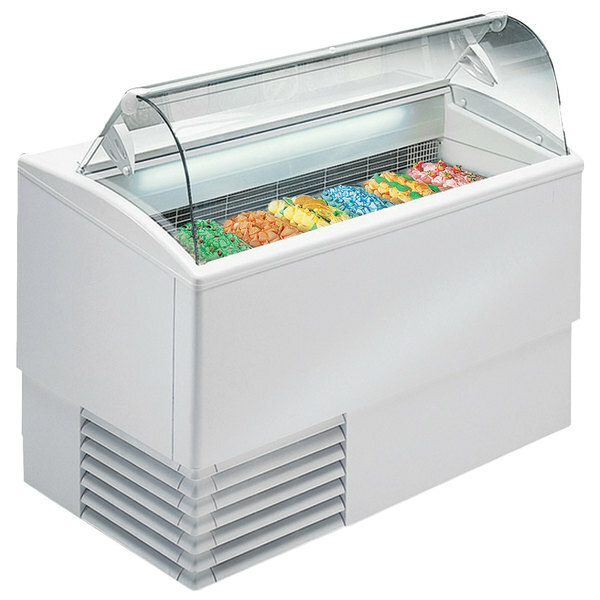 The Excellence PFC-7 gelato dipping cabinet requires a 110V electrical connection. RESIDENTIAL USERS: Vendor assumes limited liability for parts or labor coverage for component failure or other damages resulting from installation in non-commercial applications. Non-commercial customers are not eligible for installation or service coverage. The right is reserved to deny shipment for residential usage; if this occurs, you will be notified as soon as possible.